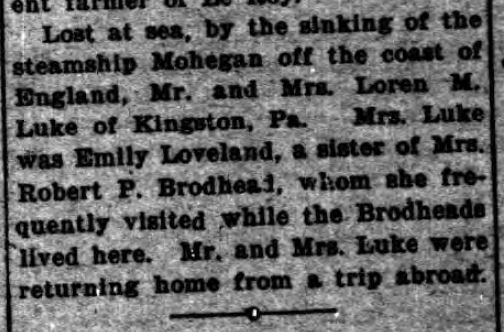 Although some of my past posts may make it seem otherwise, all was not doom and gloom for the Brodheads, Lovelands, and Lukes of Kingston, PA. In fact, I’m sure that all the good far outweighed the bad, with a small article in the Wilkes-Barre Times serving as a small example. 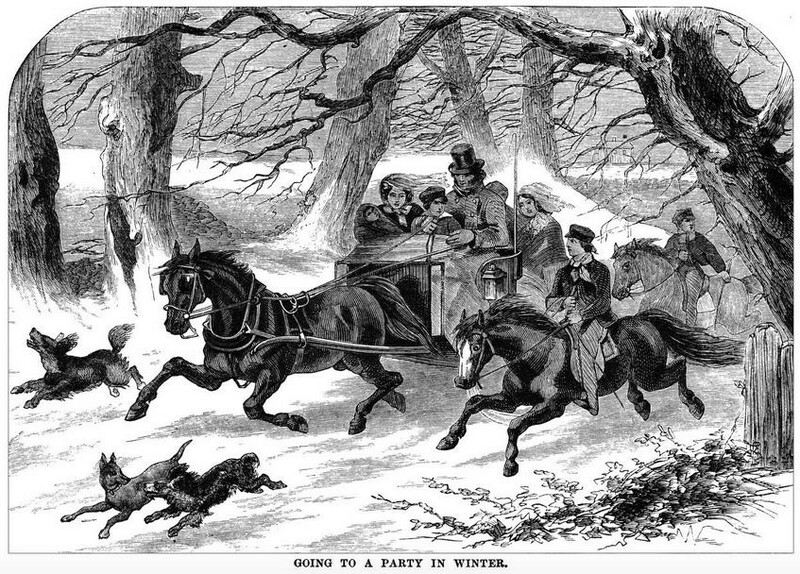 On the evening of 23 January 1895, four big bobsleighs carrying some 75 Kingston residents—including Mr. and Mrs. Robert P. Brodhead, Loren Luke, and Emilie Loveland (the latter two not yet married)—headed off to a dinner dance in nearby Dallas, PA–roughly an eight-mile journey. 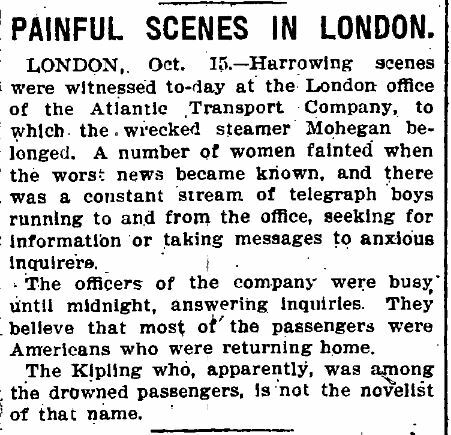 The departure for the return to Kingston took place at roughly 1 a.m. What a fun night that must have been! A goldmine of old portrait photos and biographical information can be found in the book The Wyoming Valley in the 19th Century. Art Edition by SR Smith, Vol I, Wilkes-Barre Leader Print, 1894. I found several Brodhead- and Loveland-related photos here. Maybe you’re looking for photos or have some unlabelled photos from that era and area of Pennsylvania. 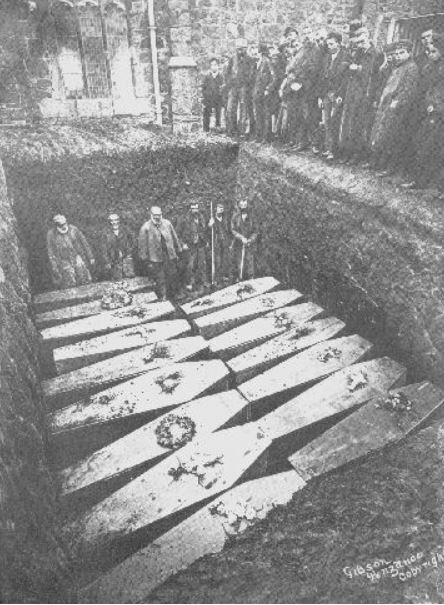 Perhaps, this is a chance to find a photo and/or identify some of those ancestors. Volume II no doubt also contains rich information; so far, however, I have not come across that volume online or elsewhere. If anyone knows where one can be found, please leave a comment. Meanwhile, you can access Volume I via the link above. A variety of formats are available for viewing. (The online book seems to have the best resolution for viewing photo inscriptions.) Happy hunting! 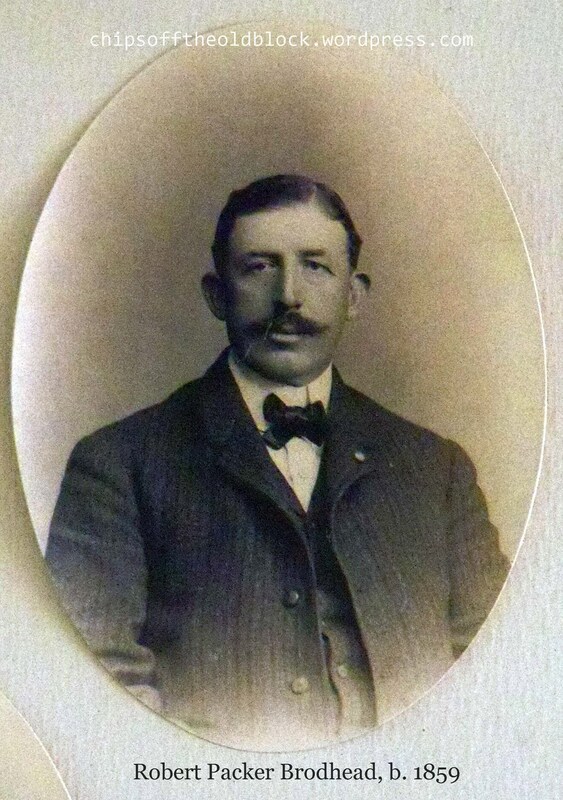 One of our great great uncles was Robert Packer Brodhead (b. 1859), one of Andrew J. Brodhead and Ophelia Easton Brodhead’s sons. Here he is in a photo that is part of our family collection. 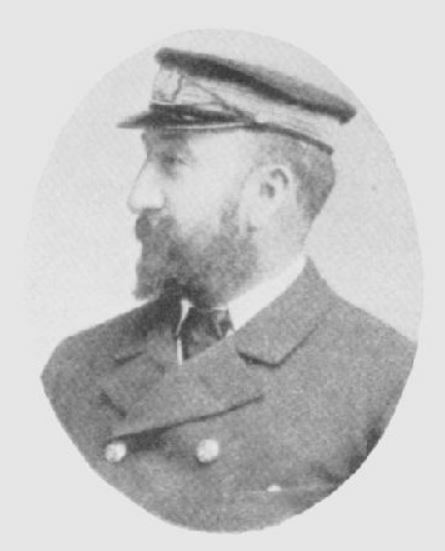 One of the benefits of researching him is that you’ll easily come across an interesting biography on Robert in the out-of-print Colonial and Revolutionary Families of Pennsylvania by John W. Jordan (published in 1911 by Lewis & Co., pp. 906-911). 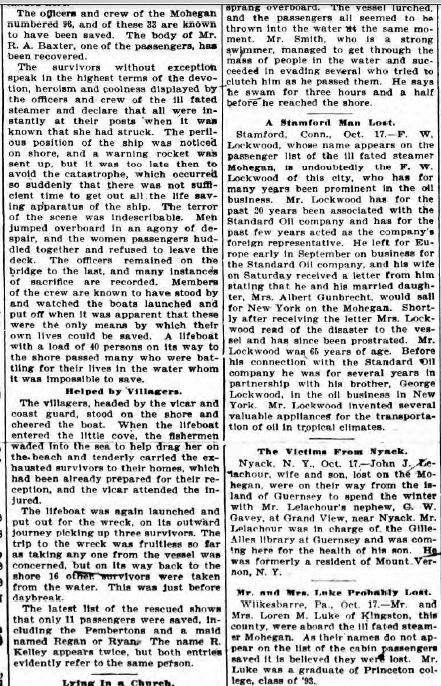 These pages give extensive information on many Brodhead names, details, and significant dates. I could swear I downloaded it on Google Books for free last year, but now it does not appear to be downloadable. So instead, go to the interesting genealogical website “Diana, Goddess of the Hunt–for Ancestors,” and you can read it there. 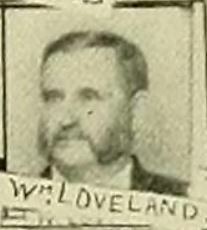 Image of William Loveland (father of Fannie V. Loveland) from the book: The Wyoming Valley in the 19th Century. Art Edition, by S. R. Smith, published in 1894. 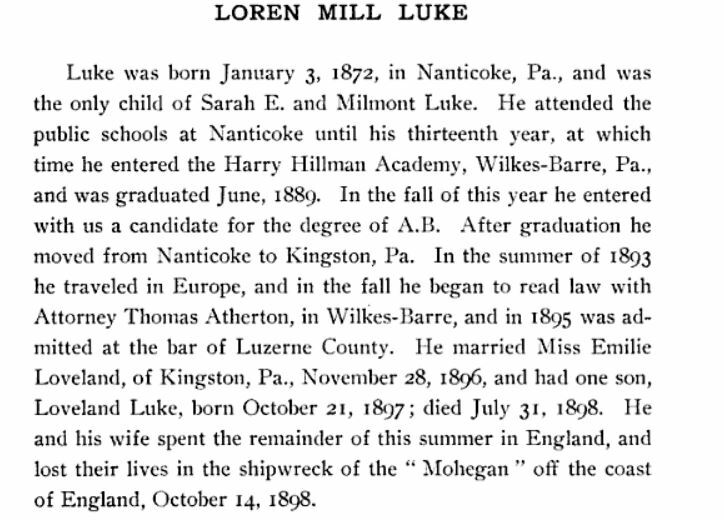 I also came across Robert’s May 1889 marriage announcement in another book (published in 1892, hence copyright is expired), History of the Loveland Family in the United States of America (p. 143). Sounds like an absolutely gorgeous ceremony, with the bride decked out a la Kate Middleton. Certainly some lovely gifts as well. Somehow you can’t imagine anyone advertising such things today–burglars would have quite a heyday, especially knowing bride and groom were away for three weeks of honeymoon! Indeed, times have changed! The John Jordan book gives a good glimpse of where things went post-ceremony: “numerous and exceedingly weighty” business interests in a wide variety of places and six children born between 1890 and 1906, Robert Packer, William Loveland, Lydia Hurlburt, Frances Loveland, James Easton, and Charles Dingman, all likely deceased by now sadly, but no doubt they left behind numerous children and grandchildren. 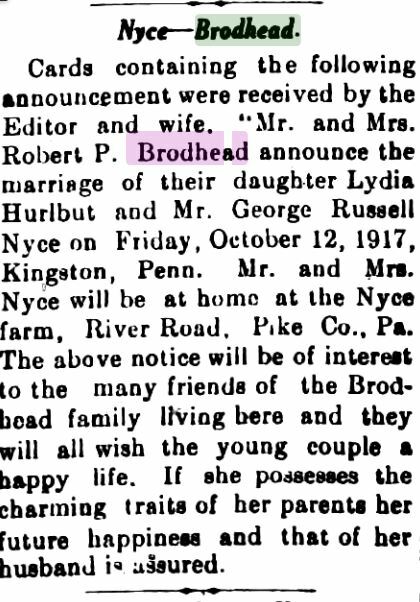 I’d be interested to hear from any descendants who may have details on the family to share, especially about Andrew and Ophelia Brodhead and their predecessors and other children. 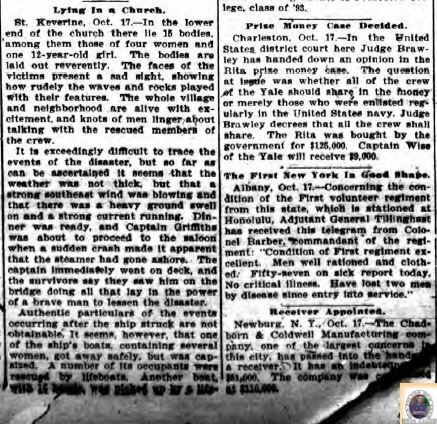 Later in the evening, daughter Lydia made “her social bow” to society during a special evening reception “principally for the younger set.” Coincidentally, I found her wedding announcement, which came out three years later, on the wonderful http://www.fultonhistory.com (they allow snippets of articles to be used, so I am posting it below). I looked up the Kingston address; I found no Google street view or real estate listings for it, but I found a neighboring property listed for sale which looks very much like it could have been of that era. Update 10/2/13: I’ve come across the below bios of Robert P. Brodhead and William Loveland in the book The Wyoming Valley in the 19th Century. Art Edition, by S. R. Smith, published in 1894. Bio from The Wyoming Valley in the 19th Century. Art Edition, by S. R. Smith, published in 1894. From The Wyoming Valley in the 19th Century. Art Edition, by S. R. Smith, published in 1894.